Architectural histories, as you would expect, look at architecture from a broad perspective and rarely discuss single examples in great detail: rather, they treat history, more often than not, as a sequence of styles. Pevsner’s An Outline of European Architecture, written during the Second World War when huge air fleets threatened to reduce English and German cities to smouldering piles of rubble, constructed his account moving from Romanesque to Early and Classic Gothic to Late Gothic, and on to Renaissance and Mannerism styles. Ornamentation, though acknowledged, was far less—much less-- important, than style: form and space, the spirit of the time, changed cultural values and together played a much larger role in determining his narrative. 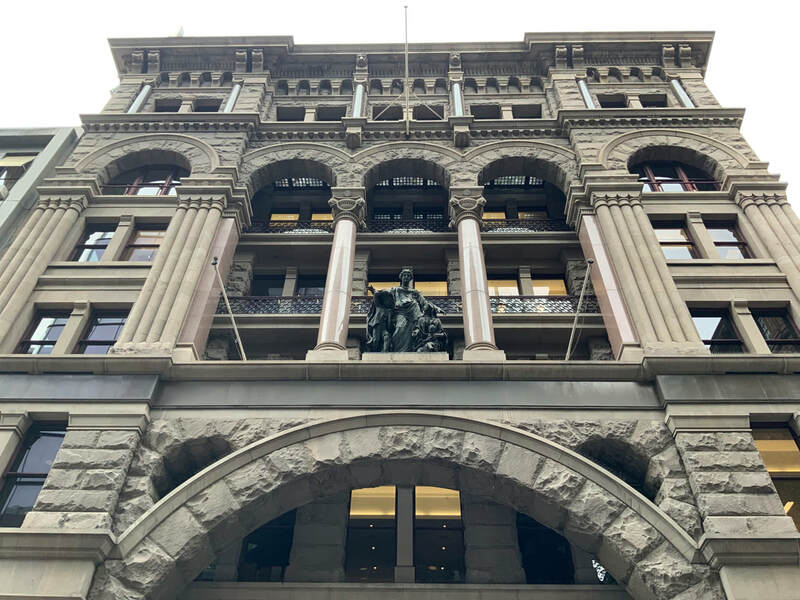 The former Equitable Life Assurance Society building at 348-352 George Street, Sydney, was designed in the Federation Romanesque style by Edward Raht, and constructed in 1894. It was built round a steel frame and entirely faced in volcanic trachyte quarried at the Mount Gibraltar Quarries near Bowral. The building is heritage listed. Image by Hamish Robertson. 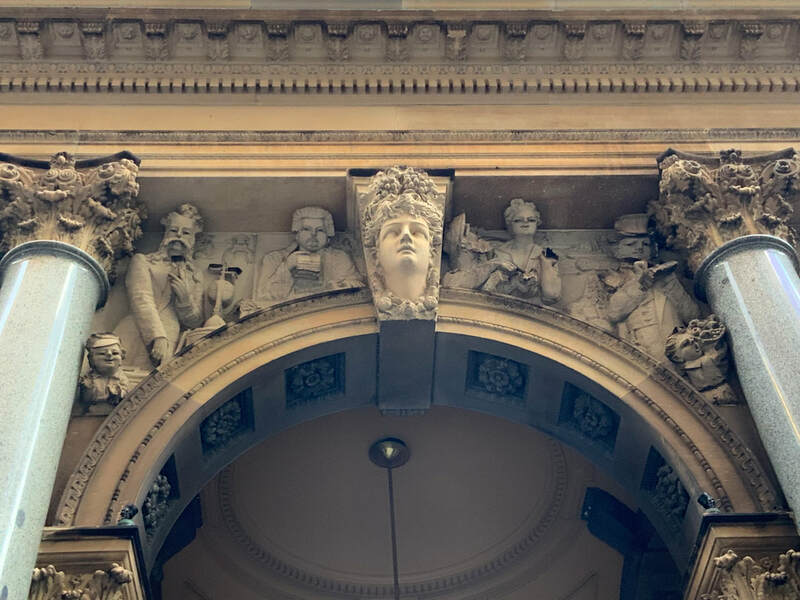 My interest in sculpture and its relationship to architecture in the nineteenth century shifted, and in some respects overturned how I see architecture and the way architecture communicates its meanings to society. In 1965, Sigfried Giedion restated this as: “The architect’s right of expression”. What he was defending was something much more radical, amounting no less than the architect’s right to treat architecture as pure sculpture. This shift in my view, looking at architecture through a different lens entirely, has altered how I now understand and appreciate architecture. I would like to introduce you to this new way of understanding and appreciating architecture. In essence, what it amounts to is a new comprehension, understanding architecture through what it says as a work of sculpture; to see sculpture as something more than mere decoration, more than eye candy, but as a voice that speaks to us, that explains, expresses meaning and purpose, and communicates more directly its symbolism. What seemed but minor things, now loomed large; aspects which previously had occupied the foreground shrank in importance, and retreated into the background. Following this approach, developments which other historians had passed over and ignored took on and assumed a new significance, and were important in the overall story. It was as though previously the foreground had retreated and the background had moved forward and replaced it. I was seeing architecture through an entirely different lens. You may remember a photograph taken of the painter, Russell Drysdale, looking at a painting he was working on through binoculars. The odd thing about the photo is that he is holding the binoculars back to front - in reverse - with the large lens close to up to his eye. Drysdale did this so the painting appeared farther away from him, so he did not need to walk back and away from it to enable him to see his work as it would appear to a more distant observer. If you spend much time looking at paintings, you soon discover how different they are close up; often they are reduced to incoherent abstract splashes of colour and overlaid brush strokes, that, looked at from afar, resolve themselves as realistic depictions of pearls, skin, textiles and patterns that miraculously resolve into glowing pearly spheres. A Gainsborough landscape that was a windblown wheat field of random brush strokes suddenly becomes a languid stream and a cart. The painter employed an abstract visual code that tricks the eye into seeing it as a photographic image of a real landscape. You get much the same effect when you enlarge a digital image and reduce it to a collection of coloured pixels. Paying attention only to the background of architecture, to a building’s sculpture, and dismissing the foreground, has given me an entirely new and extremely rich way of viewing architecture. Of turning architecture on its head, you might say, so it's not only a more fruitful, but also a far more meaningful way of looking at it. To offer another comparison: battles can be viewed from afar, from the abstract viewpoint of the commanding general who sees it all as a series of currents, reverses, thrusts and counterthrusts. This is how Napoleon saw war. Or another entirely different way, as in The Longest Day, the camera focus is on individual actions, close up storytelling of crucial individual engagements between the combatants; that while they may appear to be incidental, represent crucial and momentous turning points in the flow of battle that with hindsight were crucial in deciding the final outcome. What I would like to suggest is that this new way of viewing architecture as through the lens of sculpture, is not only an informative alternative way of following the architectural narrative, but is essential for a more balanced and deeper understanding of what architecture says about society and where we stand today. To understand any of this, one must begin to analyse what it is that sculpture contributes to buildings. I would contend that sculpture transforms a building into architecture, it supplies the dimension of art, the aesthetic edge, which gives meaning through its symbolism that speaks to viewers. Few people, I have noticed, in their hurry through life stop to look at the buildings around them, even more so with the advent of iPhones when people now walk in front of speeding motor cars without first looking at the oncoming traffic. The age of the flâneur is over. Not only that: our appreciation, the importance of sculpture as art, belongs to the 18th and 9th centuries, and only in art galleries is reluctant token recognition and acknowledgement given. And noticeably, it is not the traditional but new sculpture, well removed, in the values it prosecutes that is on offer. Not sculpture in stone. Henry Moore was the last great exemplar of classic sculpture as weighty, plastic, carved stone shaped to trigger a tactile and optical response of pleasure in us. We see through our eyes, but they have fingers which reach out to touch and stroke and feel the texture of stone or brone, while our fingers see for us, if we let them engage through their tips. Sculpture compels us to reach out and explore and touch. I recall visiting I.M. Pei’s East Building of the National Gallery in Washington D.C. 1968-1978, with its huge red Calder mobile suspended overhead in the central orientation space. Henry Moore contributed a piece entitled Knife Edge Mirror Two Piece at the entrance. The building is a precise assembly of fine materials. The form consists of two adjoining triangles which terminate at an acute angle in the north-west. I visited the gallery in 1978, just after its completion. Emerging from the entrance, the building pulled me north to where it terminated in a sharp corner. Without consciously thinking, on impulse, I reached out to touch the corner edge to test its sharpness. Looking down I saw the white marble was smudged and dirty from thousands of fingers automatically reaching out, as I had done instinctively to test the edge of the building. Afterwards, it hit me, the East Building is far more than a great work of architecture, it is sculpture, sculpture you must touch, must feel, to establish a lasting sensual connection. Great sculpture as well. ‘When our old landlady comes in to make our beds, she is usually accompanied by her favourite cat…she had noticed for some time that the creature has the intelligence of a Christian, but, even so, this was a miracle. I ran into the room to see for myself and it really was miraculous. The bust stands on a high pedestal, and the body is cut off far below the chest, so that the head is near the ceiling. The cat had jumped up on to the pedestal, placed its paws on the chest of the God and stretched itself up until its muzzle could just reach the sacred beard, which it was now gracefully licking, oblivious of the exclamations of the landlady or my entrance. When Goethe visited Rome in 1786, he could not resist buying a colossal plaster cast head of Jupiter. When he returned to Germany he placed it facing his bed, so he could say prayers to the God the first thing in the morning, and admire Greek perfection. European intellectuals collected plaster casts, produced in workshops to supply the demand in northern Europe for classical sculpture. Archaeologists such as Johann Winckelmann, who examined the remains of Herculaneum and Pompei, stimulated a passion for antiquity and Greek and Roman sculpture. Aristocrats and intellectuals, if the originals were unavailable, bought plaster copies which they displayed in their palaces and salons, or, as Goethe did, installed in their personal quarters. Sculpture rated highly. The Gothic revival after 1830 produced a demand for casts of medieval sculpture for drawing and modelling classes, to train the art workmen, who were in short supply, to conserve and reconstruct the ageing stock of derelict and crumbling Gothic churches. Stone has been an important part of the human story from earliest times, since the first hand-axes were crafted approximately three million years ago. The development of stone tools also opens a window into the minds of those who invented them. Stages in human evolution have been designated from the development in the use of stone tools, from Paleolithic (Early stone) and Neolithic (New stone) periods as measures in advancing stone technology to the bronze age. Architecture was the story of stone until about two centuries back when everything changed with the industrial revolution and introduction of new materials such as iron, steel, aluminium, concrete and new technology for glass making. Stone is now obsolete, requiring too much expensive hand labour, though it retains prestige as a permanent cladding skin on buildings. The preamble to architecture is indicated in monoliths, large shaped stones arranged in an orderly fashion or more strict geometrical forms in the landscape. Stone can be shaped to represent or mimic other shapes that have sacred significance. The idea that stone has a natural form is modern, part of a ‘truth to material’ ethical argument that is only recent, before that, in Greece and Egypt, stone repeated timber, plant and reed models that were not long lasting, hence an essentially sculptural practice of imitation was followed by these ancient stone carvers. 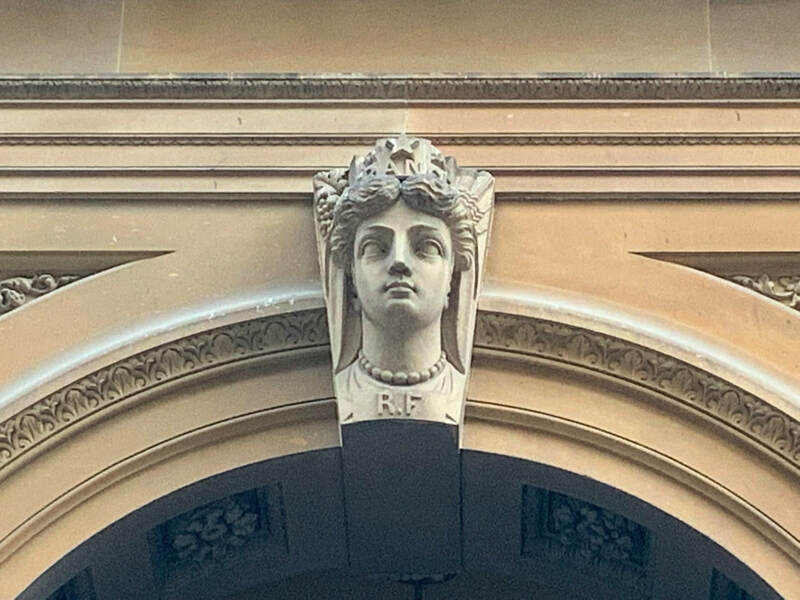 Because monumental buildings were essentially stone, with high aesthetic investments that assured their builders of permanence, and because at the same time sculpture was an embellishment to civilised structures, funerary tombs and monuments, sculpture and architecture were inseparable. This close association of the two was inherited, as was an unquestioned presumption by architects that to build in stone meant to sculpt them. Just like love and marriage, in the words of the 1955 Frank Sinatra lyrics, they went together like a horse and carriage. ‘Then comes the moment when he must carve the lineaments of the outward aspect. He has brought the play of light and shade to the support of what he wanted to say. Profile and contour have entered in, and they are free of all constraint; they are pure invention which makes the outward aspect radiant or dulls it. It is in the contours that we can trace the plastic artist; the engineer is effaced and the sculptor comes to life. Contours are the touchstone of the architect; in dealing with them he is forced to decide whether he will be a plastic artist or not. Architecture is the skilful, accurate and magnificent play of masses seen in light; and contours are also and exclusively the skilful accurate and magnificent play of volumes seen in light. Le Corbusier tells us that architecture is sculpture. The architect, if he is to be recognised as a true artist on the same level as a painter, must imitate a sculptor and treat design as a sculptural process. Although Adolf Loos had condemned decoration in 1908, the correspondence between architecture and sculpture as the component that expressed the aesthetic, and which spoke on behalf of architecture, was not ended. What had changed was the technology to be used: industrial mass production, with its requirement for comprehensive standardisation of the building elements. It is in our nature to like attractive, beautiful, shapes. Sculpture, that is traditional sculpture, may have lost its appeal, but it is now much more diffuse and pervasive. It is present in the huge variety of commodities we buy and consume, whether it is a toothbrush, a pair of shoes, a motor car, or bathroom plumbing. Even such mundane things as bath tubs have now been transformed into freestanding sculptures. And of course, more than anything, it is de rigueur for today’s architecture, whether it is by Frank Gehry or the late Zaha Hadid, to be different and highly recognisable. It can be seen as a form of public advertising for corporations, an essential contributor to product branding and product recognition in the highly competitive global city. Think of La Fondation Louis Vuitton in Paris. In my view, it's a disappointing building, loaded with unusable space; if it suggests a huge semi-transparent rose bud struggling into bloom, what Gehry is really doing, why La Fondation employed him in the first place, is to produce something resembling nothing else on earth. The building is extravagant advertising, sculpture used to sell a commercial message about Louis Vuitton and its success. That, and only that, is what it's all about: the rest is vacuous, without anything more meaningful. That exactly is what Louis Vuitton called on Gehry to provide, a sculptural extravaganza that is desperately interesting. Sculpture sells products, gives an edge by appealing to an inbuilt love and need of beauty in our lives that lifts us out of our dull repetitive existence and inspires us. It is much the same motive as described by Goethe: to bring perfection, an aesthetic high, as an ingredient in our daily experience. We may not possess the genius to create such beauty ourselves, but in going to an art gallery or concert hall we can experience the sublime created by more gifted talents. “the ruler of heaven graciously looked down to earth and saw the worthlessness of what was being done and resolved to save us from our errors", so he “decided to send into the world a great genius who would be skilled in each and every craft, whose work alone would teach humanity how to attain perfection in design by correctly drawing and by the use of contour and light and shadows". How, in fact, to use the right judgement in sculpture and architecture to create buildings which are comfortable and secure, healthy, pleasant to look at, well-proportioned and richly ornamented, which have - and this is important - the gift of poetic expression. This is where sculpture enters in to lift architecture above the merely ordinary. It's very likely that Le Corbusier read Vasari, it’s probably from Vasari that he takes his emphasis on ‘contour’. Over more than three millennia, until quite recently, sculpture was subordinated to architecture. It was effectively its messenger, speaking for architecture through inscribed texts, whether hieroglyphs or cuneiform or Roman, and accompanied by stone pictures to edify viewers. During the Renaissance the message was ‘Nobility.’ With the Romanesque, sculpture was didactic; Gothic sculpture had a similar function and was also didactic, but it also delivered a powerful metaphysical message as well as instructing. By the nineteenth century, in sculptor Thomas Wran’s time, it transmitted more varied meanings, sometimes mundane, otherwise idealistic and elevating; in Australia, it was enlisted to project British Imperial power and authority and represent the Crown in distant colonies and substitute for troops on the ground. It should be clear from this that Read wants us to understand that building, plus sculpture, equals monument and it possesses a magical aura comparable to that of an amulet worn on a person as protection against evil. The views expressed in this article are those of the author, and do not necessarily reflect the opinions of SFAUDi.